As a rule, 50th anniversaries tend to be special occasions, but even more so when business is booming and orders are on an upwards curve. That’s the fortunate situation Baltic Workboats finds itself in, as a trip to the company’s building facility, on the Estonian island of Saaremaa, attests. Baltic Workboats’ 5,500m² yard is flanked by wind turbines: the company took the decision to ‘go green’ a couple of years ago, and currently draws on 10% of the energy generated by these turbines – in combination with roof-mounted solar panels – to run all of its vessel construction operations. A total of 40 naval architects now work in the Baltic Workboats’ Tallinn and Saaremaa offices. “Most of our naval architects are from Estonia and Finland, but we also have personnel from Sweden, Russia, the UK and even Asia,” Joel Rang, sales and marketing manager, explains. The facility has been through a lot of redevelopment in the past five years, including investment in CNC and laser-cutting technology and the creation of a slipway with a capacity of 850tonnes and a 4.5m draught. This complements the yard’s existing, 150tonnes-capacity slipway.The site can build vessels of up to 100m in length – a capacity that was recently put to the test with the construction of the 100m x 18m, 297-passenger / 80-car road ferry and ‘floating bridge’ Neptunus – all of steel and/or aluminium fabrication.Certification includes ISO 9001: 2008 (DNV) and ISO 14001:2004 (DNV). It’s all a far cry from Baltic Workboats’ genesis as a repair yard in 1967, a period that lasted until a pair of domestic entrepreneurs acquired the company in 1998. The period of 2001-2004 saw the production of Baltic Workboats’ first pilot boats (including the debut Watercat Pilot 140 class) and, in 2007, the builder launched its first 24m vessel, a patrol boat for the Latvian Naval Forces Coast Guard Service. 2013 saw the company contracted to produce its first ever 45m newbuilds, in an order for two (later extended to three) ice-breaking, double-ended passenger ferries for the Estonian Maritime Administration. Each of these uniquely styled sisters featured the capacity to carry 200 passengers, 32 cars and two lorries, and was powered by twin 1,000kW Rolls-Royce US155 engines, delivering a speed of 12knots. The first two, Ormsö and Kihnu Virve, were delivered in 2015, and the third, Soela, was delivered in Q2 this year. Late 2015 also saw the delivery of the company’s 15m x 4.5m wave-piercing pilot vessel AHTO-14 to the Estonian pilot organisation Eesti Loots, which managed to combine a shallow draught of approximately 0.85m with a twin-screw arrangement capable of carrying six pilots at speeds of up to 27knots.Baltic Workboats subsequently tweaked this design, producing AHTO-15 to woo the offshore wind farm support market. AHTO-15 measures 20m x 5m and can carry up to 12 turbine technicians. Twin Volvo Penta D16MH engines, each rated 552kW and driving fixed-pitch propellers, enable a speed of 30-31knots, with a range of 300-400nm. The company’s latest design – and one that could cause some shake-ups in the coast guard, police and naval sectors – is the 4500 Wave-Piercing (4500WP) multipurpose patrol boat concept, which manages to pack a 30knot punch into a 44.6m x 8.8m frame (see picture, above and technical particulars box, below). As well as featuring the power to conduct coastal patrols and interception work, the 4500WP is envisioned as being capable of responding to fires and oil spills, undertaking hydrographic tasks and, in its quieter moments, even servicing buoys and providing support to navigational networks. 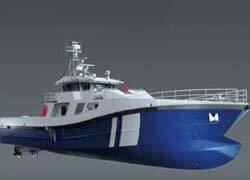 The vessel has been designed for operations in harsh conditions, with the ability to cut through 100mm of ice. Other onboard equipment includes a pair of fire monitors, each rated 600m³/hr, as well as oil collection equipment and a 7m aluminium rescue boat. This vessel will be delivered in 2018. So far, the 4500WP vessels have matched a pair of MTU 16V4000 engines, rated 2,000kW apiece, to fixed-pitch propellers, running through twin ZF gearboxes. However, Baltic Workboats has created an option for a hybrid diesel-electric version of this vessel, which would utilise two Volvo-Penta D11 gensets and a 500kW generator, thereby assisting coastal and inland users to comply with stringent rules on emissions. The company has already experimented with diesel-electric power, having developed a similar solution for its prototype Pilot 160 low-emissions, ice-going pilot boat class – a vessel measuring 16m x 5.3m, drawing 2.4m, displacing 58tonnes and capable of ploughing through up to 500mm of ice.